Around this time of year, when it feels like spring may never come, Whidbey Island always makes for the perfect escape. I’ve had a serious case of late winter gloom lately, so since Andy and I had our first entirely free weekend of the year, it was an easy decision to head to Whidbey. 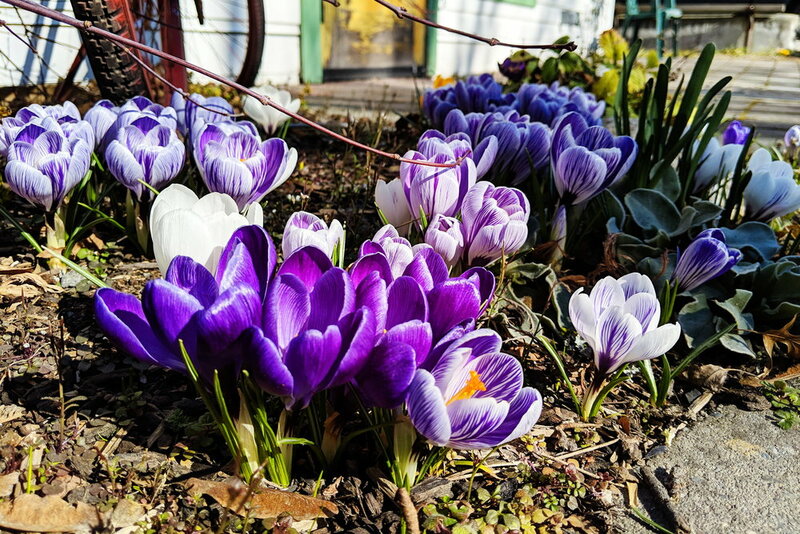 Happily, while the temperatures were still decidedly wintry, we found sunshine and even a few early spring blooms! It was miraculously warm enough that on Saturday night, I was able to sit outside with my glass of wine to enjoy the sunset - wearing a heavy wool sweater of course! Spring may still feel a long way off, but even a few hours soaking up some sunshine will do wonders to tide me over until we’ve left winter behind. After another week of mucky snow that just won’t go away, I didn’t venture far from home. My week was mostly work and knitting, although I did manage to get out for a lovely lunch with my mom and niece that gave me a much needed mid-week sanity break! By the weekend, I was beyond happy that my March Alpine Trails Book Club outing finally provided the perfect opportunity to to get outside. It may have been cold and overcast for most of the day, but we had a snow free hike, and even saw a few brief bursts of sunshine! It still felt like February, but the passing moments of warm sun on my face gave me hope that spring is still on the way. Whidbey Island is my favorite place to be in stormy weather. Sheltered in the warm and cozy in the cabin, I can watch as the sea and sky both turn a steely grey, and rain and wind lash the windows. Luckily for me, we had perfect stormy fall weather on our last minute weekend trip to the island. Before heading to the cabin, we stopped in Langley for coffee and some bookstore browsing, and I picked up the perfect weekend reading material. For the first time I can remember, we hadn’t packed a ridiculous amount of food, and we wound up having a dinner of chips, salsa, and breakfast sausages. Oh, and plenty of red wine. Not sure what we’d been thinking when we packed food for the weekend, but we survived! We've reached the depths of summer - days when it's too hot for much beyond hiding in the shade with a cold beer. I'm just not built for long periods of hot weather, and when the temperature climbs over 80° for too long, my brain starts to turn to mush. By the weekend, I was desperate to escape our stuffy apartment so after work on Friday, Andy and I fled to Whidbey Island. Thankfully we found the cabin breezy and significantly cooler than our apartment, leaving me with the energy for several long rambles along the beach and through the neighborhood near the cabin. On the beach there were pretty shells tiny crustaceans to poke at, and up above the bluff, the road was lined with blackberries ripe for snacking. After a Saturday lunch in Langley and a stop at my favorite bookstore (where I picked up this gem), Andy and I spent the afternoon drinking wine and reading in the dappled sun on the deck. 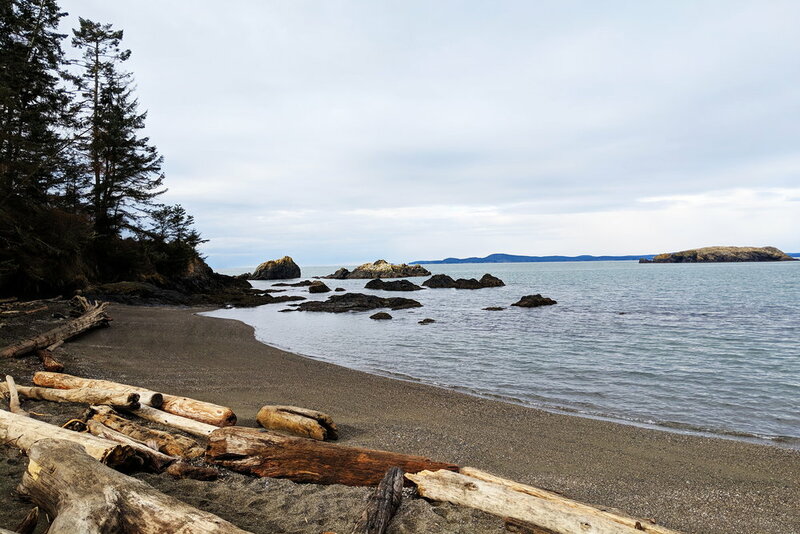 While an escape for the weekend made a nice break, I keep dreaming of having the time to spend a whole week on Whidbey, to really let the peace of the island soak in - and maybe even finish reading a book or two!